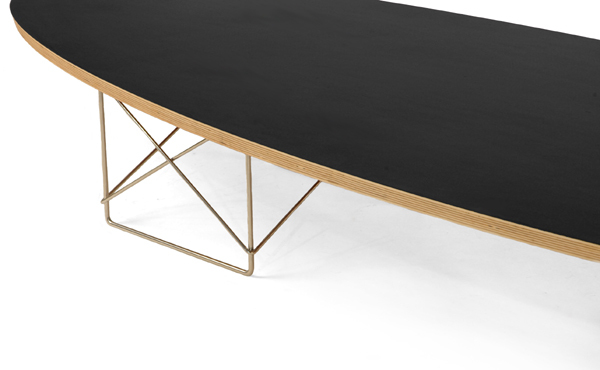 This table is a mid-century 1951 classic inspired design. Dubbed the "surfboard table", this elongated Elliptical table illustrates the whimsical playfulness that characterizes the work of this legendary American designer. It also reveals the couple's practical side - their desire to create furniture that would become a part of a life lived with minimalism and splendor. This 6' foot table sets the stage for a bowl of fresh fruit, a special work of art or a big art book. Its light wire base and long lean silhouette look just as totally modern today as then. This iconic piece is constructed with a chrome steel frame, birch plywood surface with a melamine top in your choice of black or white colors. 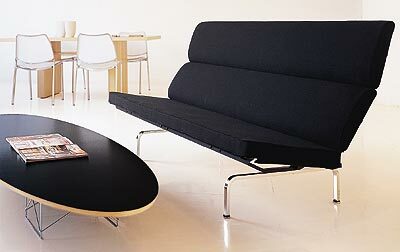 This is a perfect copy (and is not a Herman Miller release) of the same unit at a fraction of the price! DIMENSIONS : W X 71" X D 24" X H 10"
Click color thumbnail to enlarge.